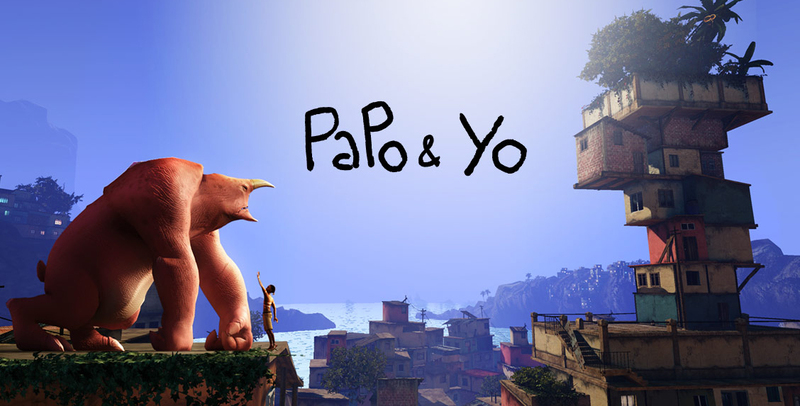 Papo & Yo tells the emotional story of Quico, as he travels around the towns of Brazil with his monster. From beginning to end, its fascinating to see the pairs relationship evolve. I recall reading a edge article about how Papo & Yo was a landmark game for the Brazilian games industry, and how it showed they were starting to mature, becoming a part of our inclusive and unique industry. 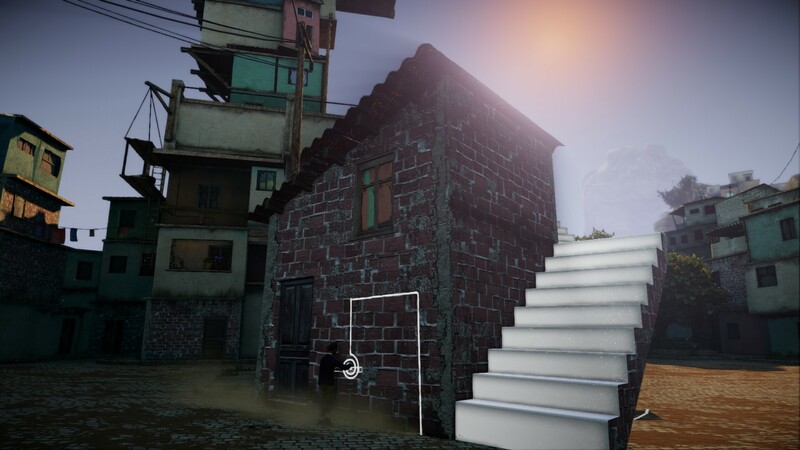 Whilst all of this is true, Papo & Yo isn’t just a great game because it’s Brazilian, it’s a good game because it’s unique and charming, and tells a story like no other medium can. The graphical fidelity of Papo & Yo is astounding, leading to breathtaking scenes like the one above. It’s highly polished, making it feel spectacular that a small indie team made all of this. 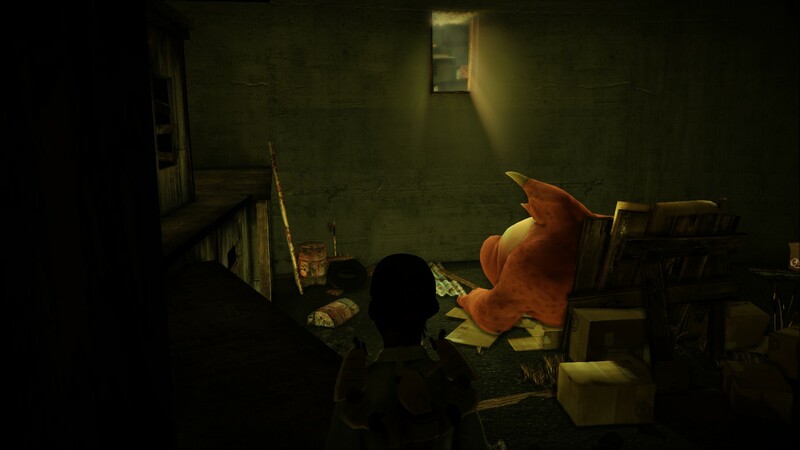 You start the game off as a little child named Quico, who’s stuck in a cupboard as a monster is stomping around outside the doors trying to get him. Out of nowhere, a teleport appears next to Quico, inviting him in to get out of this current nightmarish situation. Going through the teleport, Quico is transported to a warm, tranquil, sunny town; a far cry from the nightmare he just got out of. It’s here that you take control of Quico and start to explore your surroundings, jumping off roofs and climbing ladders to find anything relating to the progression of the story. Eventually, a girl with white body paint will start talking to Quico, telling him he is cursed and that he should stay away, to which you proceed to chase her around this strange and enticing environment. Following this mysterious girl around is what brings you to one of the core mechanics of the game: Gears. Gears, and in turn anything that is made using chalk can be used to manipulate the world to Quico’s advantage. Putting a chalk gear in the right place will cause a whole house to sprout legs and move to the correct location, or rotating a chalk lever will create stairs to get to higher places. These challenges and puzzles will soon start becoming harder as the game progresses, but are relatively simple and used more for aesthetics at the beginning of the game. The animations that are played when the chalk is touched is unique and quirky everytime, from buildings that bend, to manipulating bridges made out of houses you’ve made yourself, every touch of the chalk brings with it a new, wonderful surprise. Being able to manipulate the world is a fantastic feeling. Unique each and every time, every new lever is exciting to activate, with stairs appearing from walls and houses coming to life, the world itself feels alive and genuine. Sooner or later, you’ll stumble across a big hulking monster, one which you’ll need to utilise in order to progress through this strange and weird world. The monster has his own agenda, meaning Quico has to grab it’s attention using items in the environment. The monster is slow, but most of the world revolves around him standing on certain platforms, so it’s your responsibility to get him to the correct places in order to advance. You can’t help but feel you’re caring for the monster in some weird way, with it doing nothing but sleeping and eating unless you go out of your way to distract it into helping you. 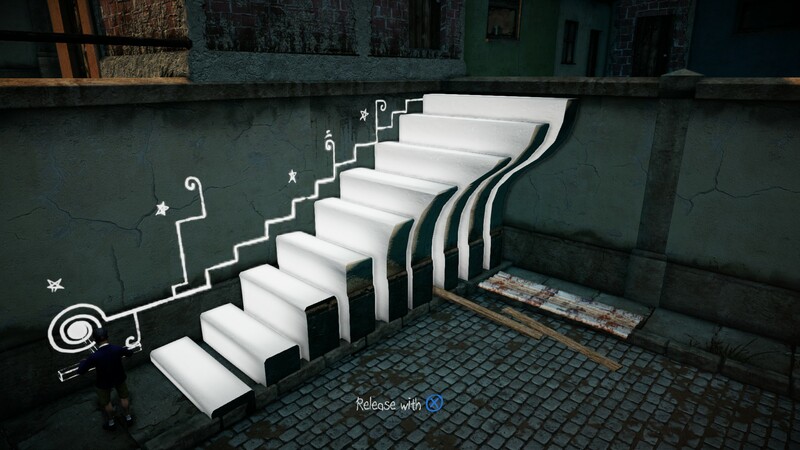 The story of Papo & Yo is what takes the centre stage in this strange and beautiful puzzle game. The relationship between Quico and the monster really draws you in, constantly trying to make out the intricacies of their relationship, and why they go through times of hardship, but also times of love. The game mechanics play into this, with Quico literally helping the monster in becoming angry, or calming him down with the use of items around the world. This relationship will evolve throughout the duration of the campaign, and many visual metaphors to real world objects will be seen before you come to the games true conclusion, explaining the core pillars of Quico and the monsters relationship. Some puzzles will require manipulating the world to suit your needs. Here, the path needs to rotate for you to get onto a roof before manipulating it again to get on another roof. It’s simple, but fascinating every time. The world Quico explores is lovely and vacant, giving you the sense of what it feels like to be in the slums of Brazil, but without the busy, bustling streets. It gives an eery feel to the game, but also implores a sense of exploration. You want to find out more about this world, as much as it may be a dream world for Quico to run away too in times of need. The strange chalk girl also entices you to carry on with the campaign, ensuring you constantly have a hook, pushing you ever closer to the conclusion. For all the good Papo & Yo gives the player, it isn’t without it’s niggles. The camera can certainly take some getting used too, pushing into geometry, and generally getting in the way of you controlling Quico at times. The platforming moments can also be a hassle, with Quico not equipped deal with the preciseness you occasionally need when jumping across floating bricks or brooms. I enjoyed my time with Papo & Yo: it took me on a journey you don’t usually experience, with south American culture rarely being seen in todays media, usually keeping to itself. The story is certainly moving, and will keep you hooked until the end, but once all is said and done, there isn’t much left to see, meaning Papo & Yo isn’t very replayable. I bought Papo & Yo over christmas, paying just £4, which I felt was a good deal for the 3-4 hours of entertainment it gave me, if you can find it for cheaper, grab it! It’s a bargain. If not, then value is in the eye of the beholder, and if you truly value artistic expression in video game form, then you’ll love every minute Papo & Yo have to offer.